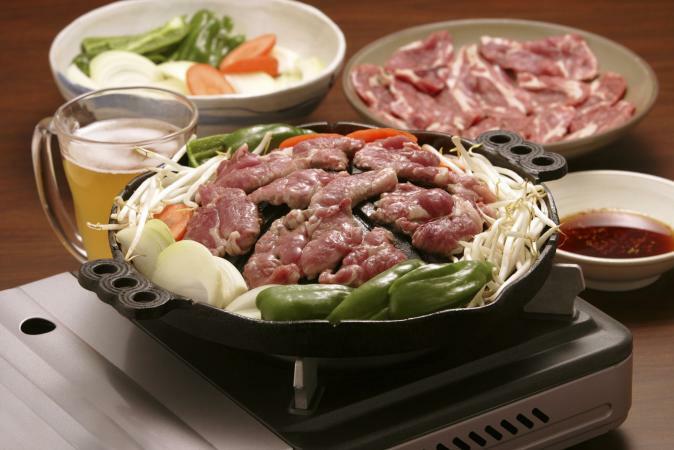 At its heart, Mongolian barbeque is a stir-fry that combines the customization of a salad bar with the cooking style of a Japanese teppanyaki grill. Luckily, replicating your favorite dish doesn't require that big giant grill. You can make it at home using some simple equipment you probably already own. At Mongolian barbeque restaurants, a number of ingredients, such as thinly sliced frozen meats, chopped vegetables, noodles and sauces, are set out salad bar-style. Restaurant patrons go through the line and put the ingredients they want in their meal into a bowl. They then give the bowl to the barbeque chef, who is working a large, flat, very hot griddle. Because of the heat of the griddle, the food is cooked in front of the diner's eyes in just a matter of moments. The patron may then pair the stir-fry with rice and any other condiments the restaurant makes available. To cook a similar version at home, you'll want to prepare and select the ingredients that resemble what you'd find at restaurants. Place the thawed meat in the freezer for about 30 minutes until it is partially frozen. Don't freeze the meat completely. Place the partially frozen meat on a cutting board. Slice the meat as thinly as you can using an extremely sharp knife. To prepare the vegetables to cook, select a variety of vegetables that you enjoy. You might want to include shiitake mushrooms, green onions, baby spinach, broccoli florets, carrots and other such vegetables that you like. You can also include herbs like cilantro and Thai basil to pump up the flavor. Thoroughly wash all of the vegetables and make sure they are completely dry. Leave baby spinach leaves and herb leaves whole. Chop other vegetables into similar sized pieces to assure even cooking. You might also want to add a few fresh seasonings like chopped garlic or grated ginger. Most prepared sauces contain plenty of salt, so there is no need to add additional salt. You may also want to add rice or noodles to your Mongolian barbeque. Choose the type noodles you want to use, and add them in small amounts directly into your stir-fry. Choices include pre-cooked buckwheat noodles, rice noodles and shirataki noodles. You can also add crispy noodles if you wish. The rice should be prepared separately from the stir-fry. Steam white or brown rice to put under the finished stir-fry. If you know how to stir-fry, then you know how to cook Mongolian barbeque. There is no need to use the specialized grill found in most restaurants. Instead, you can use a very hot wok or whatever pan you use to cook stir-fries. There are a number of techniques that you can use to help make your Mongolian barbeque as good as the stuff you find in restaurants. Fry meat in the very hot pan, along with a few tablespoons of whatever sauce you will be using. Stir-fry until the meat is cooked through and move the meat to a waiting bowl. Cook vegetables, except leafy vegetables and herbs. Stir until the vegetables are cooked to your liking - usually to an al dente stage in which the vegetables retain just a tiny amount of crispness. Add leafy vegetables and herbs and cook for just a moment, until the leaves wilt. Stir in seasonings such as garlic or vinegar and cook just until the garlic releases its scent. Pour in any sauces you wish to include. Simmer for just a moment or two to allow the flavors to meld. If you like, add chopped peanuts or sesame seeds to the top of the stir-fry. If you've ever stir-fried, then you're all set to make Mongolian barbeque at home. With a little creativity, you can easily make a meal that is even better than one you can get in a restaurant.